Cut the cord and tether wirelessly to effectively and efficiently get your shots. Getting the perfect food shot can sometimes take the whole day to achieve. I was a bit nervous to try the CamRanger for the first time at a food shoot without doing research on it first. The CamRanger pleasantly surprised me with its ease of use. The added bonus with the CamRanger is that your RAW images are saved directly to your camera’s memory card, not like other tethering software which saves the images to your computer’s hard drive. It makes me feel safer to know the complete setup has less cables, devices and the risk of images getting lost. While standing back and looking at the bigger picture I could not believe that I was controlling my Nikon from a smart phone. From the time I opened the box to the time I had an image from my Canon 1Ds Mark III to the iPad was about that 5 minutes…. Unbelievable! It’s just too easy. Now I have just want I need for those hard to shoot situations where the art director needs to see exactly what’s going on with out all the fuss of cables and computers. Out in the field where having a cable connected to your laptop is not practical, the CamRanger really shines as an incredible advantage. The software has all the features you could ask for in a wireless system. When I heard of the CamRanger, I was excited about the possibility of using it on my automotive rig shots. Previously, I was having to set up the rig and camera, roll the car, stop, adjust the exposure, roll the car, stop, adjust, etc., etc. Now I can do the setup one time and make my shutter speed adjustments on the fly, which saves a huge amount of time when lighting conditions are changing rapidly. This allows me to quickly capture a range of good exposures for the correct motion effect in the wheels and the road, and a good exposure for the sky. 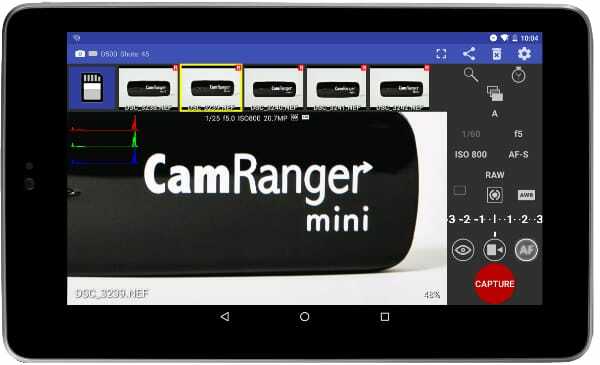 I look forward to exploring new ways to use the CamRanger! To be able to position and check the photos as I take them is as huge a benefit as the leap from film to digital! Thanks to the team at CamRanger for all their hard work – it has made my life so much easier.